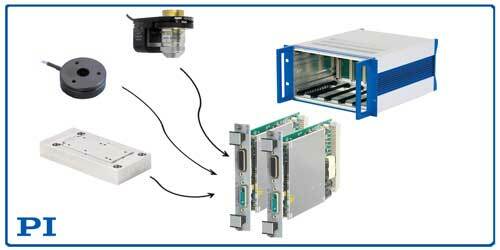 (Nanowerk News) Industry leader in motion control and nanopositioning solutions PI (Physik Instrumente) L.P. has expanded its successful E-709 family of low-cost digital piezo nanopositioning controllers with a new plug-in module for the C-885 PIMotionMaster modular controller system. PI’s Digital Motion Controller Suite Keeps Growing. The latest piezo control module, the E-709.1CC885, supports functions including wave generator, data recorder, auto zero, and I/O triggers. With a sensor update rate of 10kHz, two notch filters and linearization algorithms based on 5th-order polynomials it provides exceptionally accurate motion with sub-nanometer precision. The E-709 card combines a power amplifier (-30 to 130V output), signal conditioning circuitry for capacitance sensors and a digital servo. Piezo controllers with digital servo offer the advantage of higher linearity, and easy access to advanced features in comparison to conventional analog piezo controllers. A comprehensive software package is included: drivers for LabVIEW, dynamic libraries for Windows and Linux, MATLAB, MetaMorph, µManager, Andor iQ. Interfaces include USB, SPI, RS-232, and analog.